Even though Valentine’s Day is over, love is still in the air here on the blog through the rest of the month. 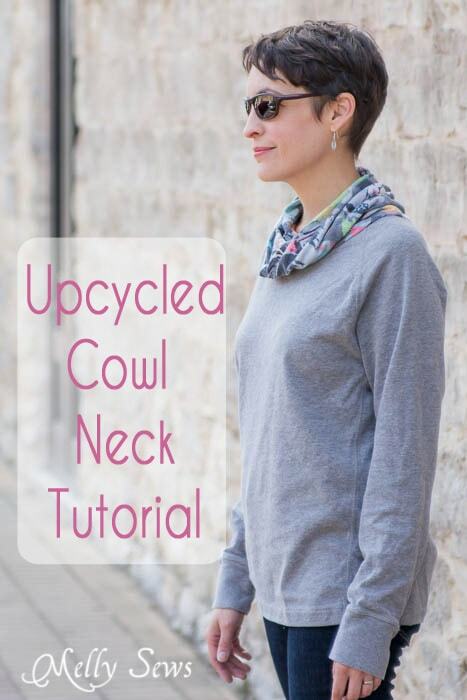 Today I’m sharing this easy cowl neck tutorial. This is an upcycle that I did to a shirt that used to belong to the hubs. Because my idea of romance is taking my husband’s clothes and making them look good on me, ha! This shirt started out as just a raglan pullover, but the neck was weirdly small. To quote the husband, “Here, this stupid shirt is choking me.” At first glance, I thought I’d just be able to wear it as an oversized shirt with leggings or skinny jeans, because obviously the neck ribbing that was choking him would fit better on my delicate and feminine neck, right? WRONG! Like I said, weirdly small neckline – it was even way too high and tight on me. Solution? 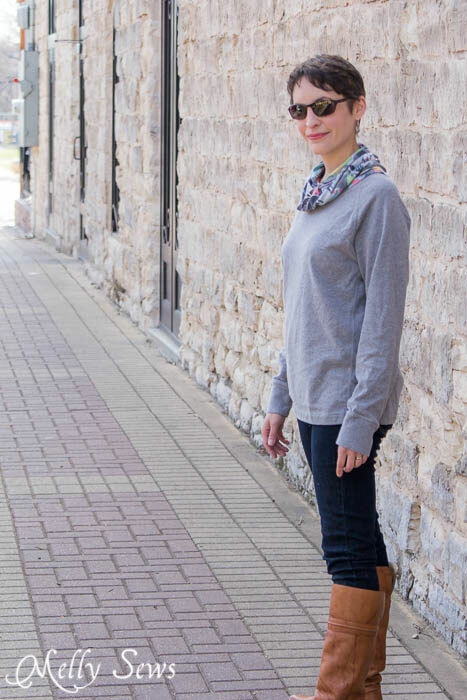 Cut it off and make it a cowl neck. I cut off the ribbing and then some. Next I measured my new neckline. And then I cut a rectangle of fabric that was 2x the width of the neckline plus a seam allowance and twice the final length I wanted plus seam allowances. Let me break that math down for you. My neckline was 13″ around. 12″ x 2 = 24″ plus 1″ for seam allowances – 25″ tall. So I cut a 27″ x 25″ rectangle. Then I folded it in half, lining up the 25″ edges. 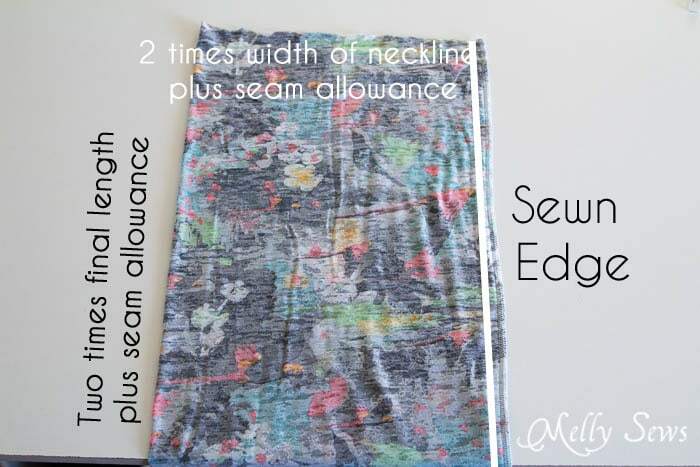 Sew down that edge to make a tube. 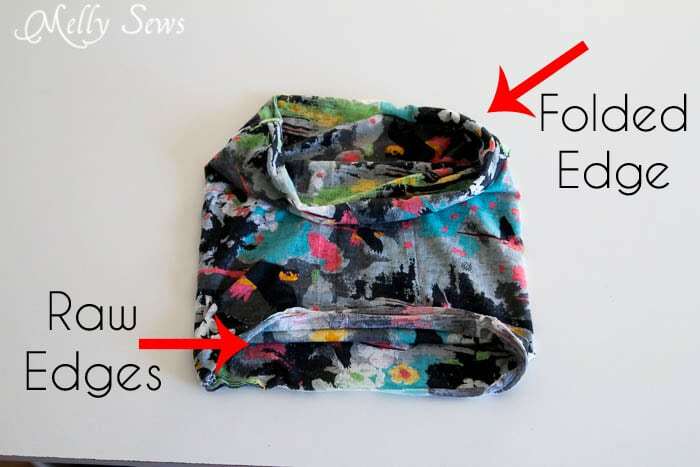 Then fold your tube so all the raw edges are on one side and you have the right side of the fabric showing on both the inside and outside of your tube. 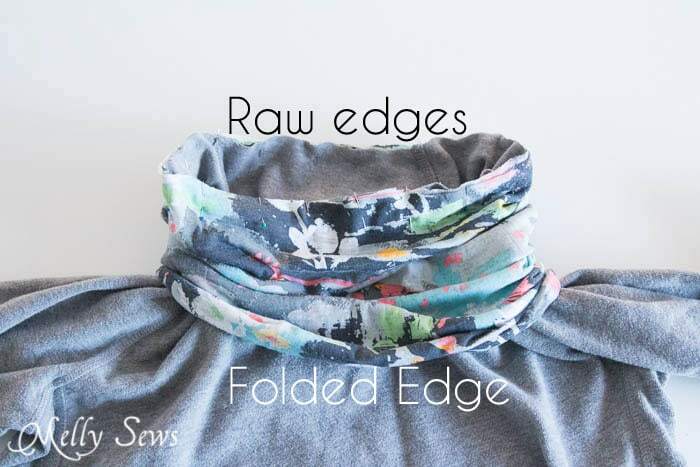 Align the seam of the cowl with the center back of your neck, then pin the raw edges to the neck edge all around. 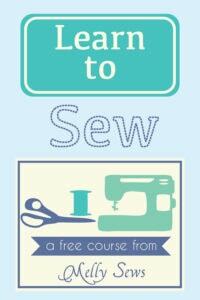 Pin and sew, using either a serger or a stretch stitch. And that’s it – pull your new cowl neck shirt on and enjoy looking hot in your husband’s old clothes. Great idea!! Cute too!! What kind of fabric did you use? You do look hot 🙂 Thanks for another great tutorial. Way cool! Great look, girlie. You look so cute with that haircut. Thank you for the tutorial. You are such an inspiration. Tanx Melly,I’m frm Nigeria I av been wonderin hw dis cowl neck is done bt tanks to u nw I knw and I can make my cowl neck and av a beautiful outfit. 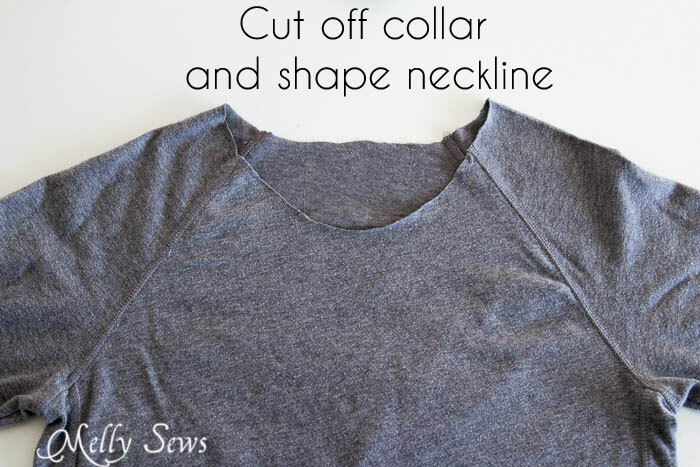 This is a perfect tutorial for adding a cowl to the neckline of a shirt. It is easy and very doable/understandable. I tried it today and love the results! Thanks Melissa…..
Great tute! 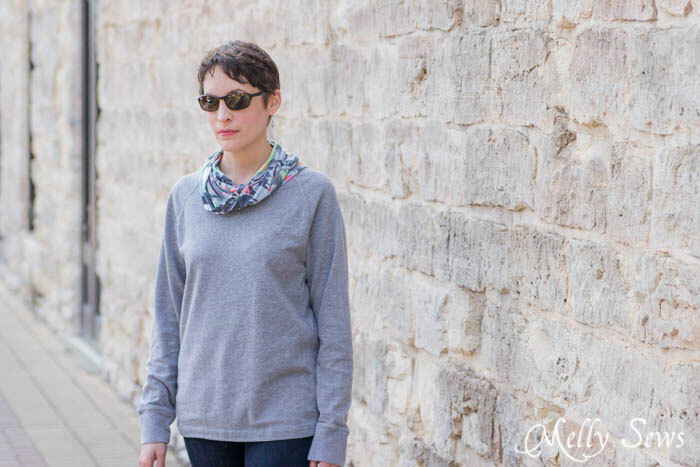 I am looking to add a cowl to my fave Blank Slate pattern, the Rivage Raglan. Gonna try!! Thank you. Thank you so much for this. I was making a long-sleeve loose t-shirt where I accidentally cut a hole near the neckline. 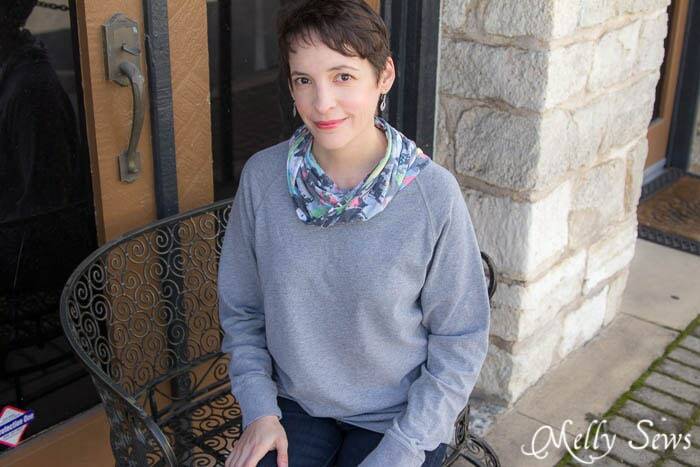 I cut off the neckband and added cowl neck as per your instructions. A save! Thank you sooo much for this. Just what I was looking for. I have a beautiful jumper that the knitted neck lost its tension. I cut the stretched part off and overlocked it. Now I need to find just the right fabric to make the cowl in. This looks beautiful, and what a great way to salvage a shirt! 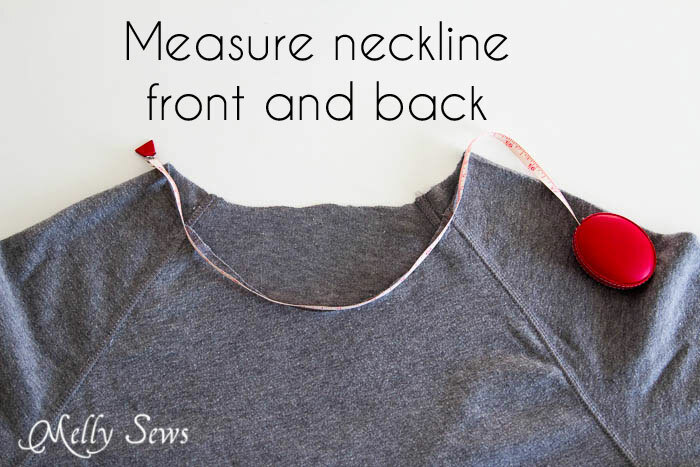 But I am confused… why is the cut width TWICE the measurement of the neckline? I understand that the “height” is 2x the finished height, because it’s folded over. I can’t figure out what happens to the extra cut width! Obviously I’m missing something here. I would love to add this to a top, just can’t quite figure it out. I may have figured it out. 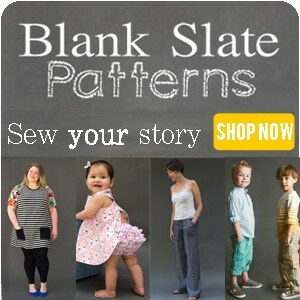 Is your first neck measurement of 13″ from center front to center back, thus requiring that measurement to be doubled? That must be the case… because 13″ is not a normal neck size for even a thin adult.